Every company tends to look for its own identity, and in some cases, shall look for somebody or something that will represent its own persona. With this, the management conceptualized a character that will represent the Ambica International Corporation and its community. Thus, the birth of Dr. Ambica. 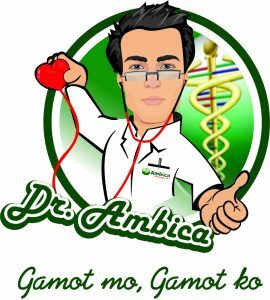 Dr. Ambica epitomizes the company as a whole, with the pursuit of bringing the best healthcare products for the Filipino consumers. It also symbolizes the hardworking men and women of Ambica, introducing the products even to the farthest reaches of the Philippine archipelago. With this pure sense in mind, Ambica considers that it is now possible and can be achieved if your retrieval success is in a repetitive state, which means if one word is repeated or is visible all the time in front of you, this state can be achieved. Hence, Ambica stresses that we keep our state of consciousness peculiar by filling the gap with repetitive and visual information available for people to remember things with ease and to fill the the void of forgetfulness. This happens to all of us. We sometimes end up groping for the word to recall information. Like a person’s name, a movie title, the name of an actor, a song, a drug, and we cannot recall it instantaneously thus we end up mumbling for words or phrases, like we know it was right there, at the tip of the tongue! (TOT). ‘TOTs’ can be irritating for a practicing physician when he is thinking of a drug’s generic name or a brand name, which in some cases is extremely difficult. And remembering a patient’s name in some cases with similar cases as that of the current patient or remembering a colleague’s name in the past or a new employee perhaps. With constant visuals in and around individuals, somebody may create a bubble of thought, in which one thing that needsto be understood and that , remembering something is like, asking, ask Dr. Ambica. Individuals, now only need to remember Dr. Ambica. So when a physician forgets a generic name, a brand name, a persons name, a telephone number, say of the owner of Ambica or the sales person in this case, it would be as easy as reminding to ask ‘ask Dr. Ambica’. This creates a brand awareness of its own or a company identity, which is a vision of any company, where the individual now recalls only the company name. It is as easy as looking up for and then giving a calling card of someone from Ambica. Alongside this, the company’s management team, combined with the rest of their employees, work harmoniously and effectively in breaking bounds in the industry and will continue to do so in the coming future.